Initially I planned to leave after the house closed, around the first of August. But, closing ended up set for August 14th. Leaving at the first of the month would allow my sister-in-law, Bev, to join me for the first few weeks of the trip. She works for the school district and had about 3 weeks off between the summer and fall sessions. When my realtor’s office said I didn’t actually have to be in Austin at the closing table I got crazy-busy getting rid of stuff and clearing out the house. 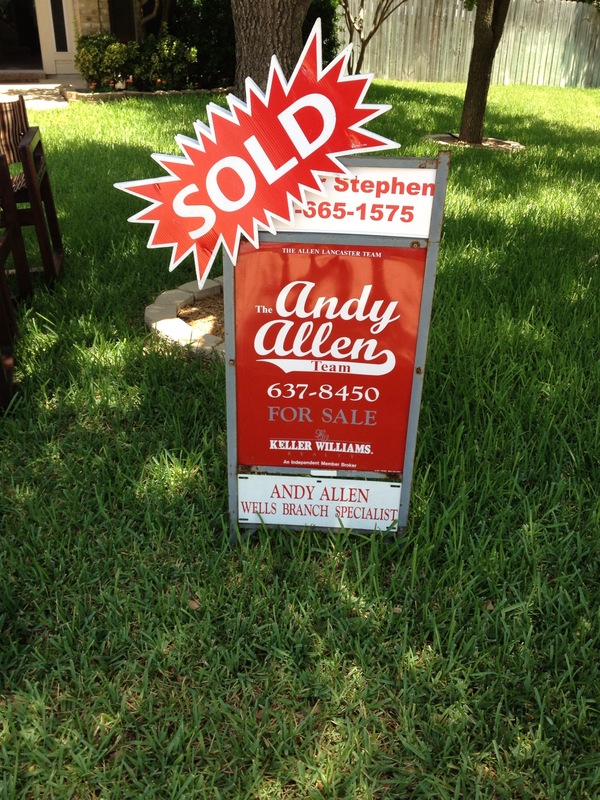 I said goodbye to my house of 15 years on 8/1 and we hit the road Thursday, the 2nd. Thanks for taking this picture, Bev. I hadn’t thought to do that! 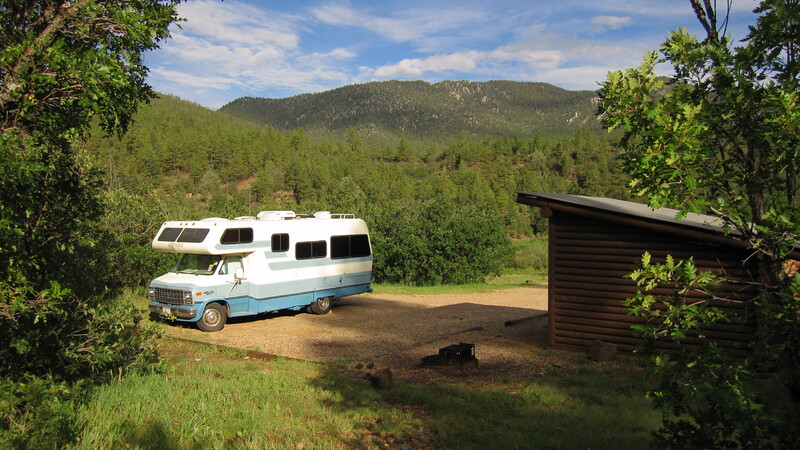 The first goal was to make a beeline out of Texas and into the higher elevations of northern New Mexico. 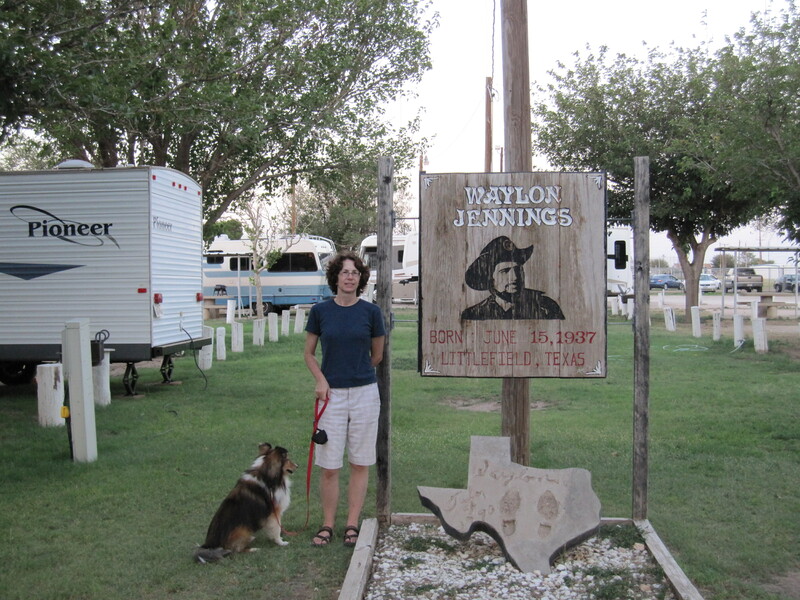 We got to Littlefield, TX on the first day and stayed at the Waylon Jennings RV Park. It’s got water and electric hookups and is free, but they do accept donations. 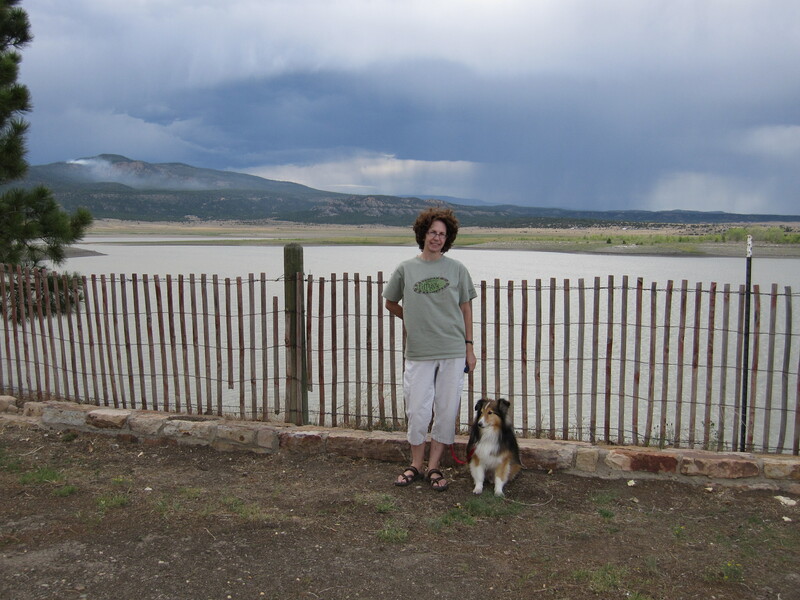 On the 2nd day we got to Storrie Lake State Park in Las Vegas. It was about 20 degrees cooler than Austin, so we were quite happy. The plan was to get up to even higher elevation at Coyote Creek, Eagle Nest or Cimmaron Canyon State Parks. (I also looked at Morphy Lake SP, but the max length is 17’. I guess it’s more of a tent/small trailer type park.) But, we decided to stay at Storrie Lake for an extra day. I really needed to organize. I had stuffed everything into the RV in a hurry and wanted to resort. It’s amazing how much stuff will actually fit into a Lazy Daze, but not everything was efficiently stored, so I had to optimize. Bev had many suggestions and we got a lot done that day. It was super windy at Storrie Lake and raining all around us. There is smoke from a fire in the hills on the left side. On Sunday we moved to Coyote Creek State Park. 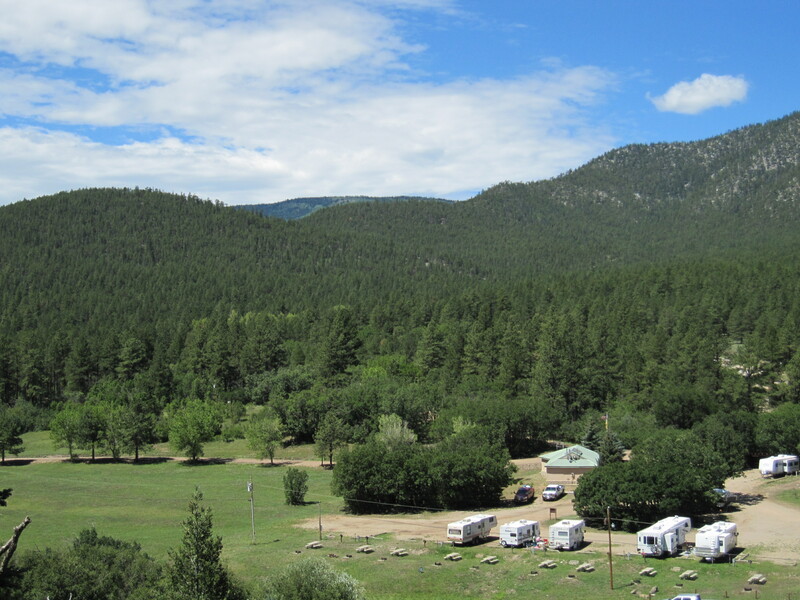 I had purchased the New Mexico park pass, so we were going to be staying at state parks along the way in NM. (It’s $225 annually for non-residents which waives the $10 site fee. So, a site with no hookups or just water is $0 and a site with electric hookup is $4. Best state park deal in the country.) Coyote Creek had electric hookups (Eagle Nest and Cimmaron Canyon don’t), so we chose that one. I had seen pictures, but we were really surprised at how beautiful Coyote Creek SP is. The electric sites were full, plus they are all right next to each other in a row, which I don’t like. So, we drove around to the no-hookup/water-only sites, which are more spread out. We chose the one at the top of the hill, above the dump station. It was a fantastic site, and even the rangers that drove by as we were setting up said it’s the best site in the park. We set up the awning, knitted, watched the rain, walked the campground, and basically enjoyed ourselves. We met fellow campers, Clive and Curtis when I was outside cleaning windows. Curtis is a fantastic photographer and Clive is a wealth of RVing info. The next day we hiked the trail that runs most of the way around the campground. It starts just past the electric sites and quickly climbs into the hill/mountain beside the park. 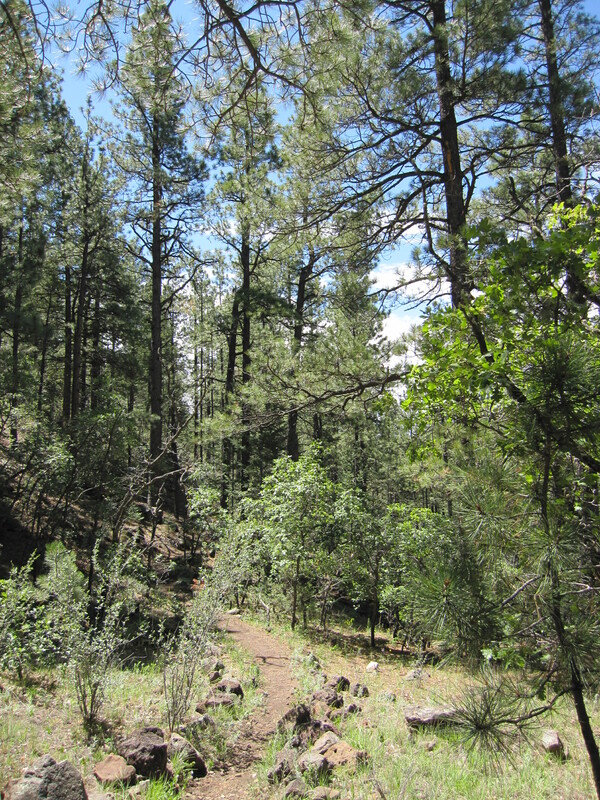 Pretty strenuous at first, then it becomes just a stroll along the ridge above the campground. There is a side trail that connects to our site. But, after a day and a half off-grid my batteries were dangerously low. I ran the generator, but it did no good. We would need to find an electric hookup. 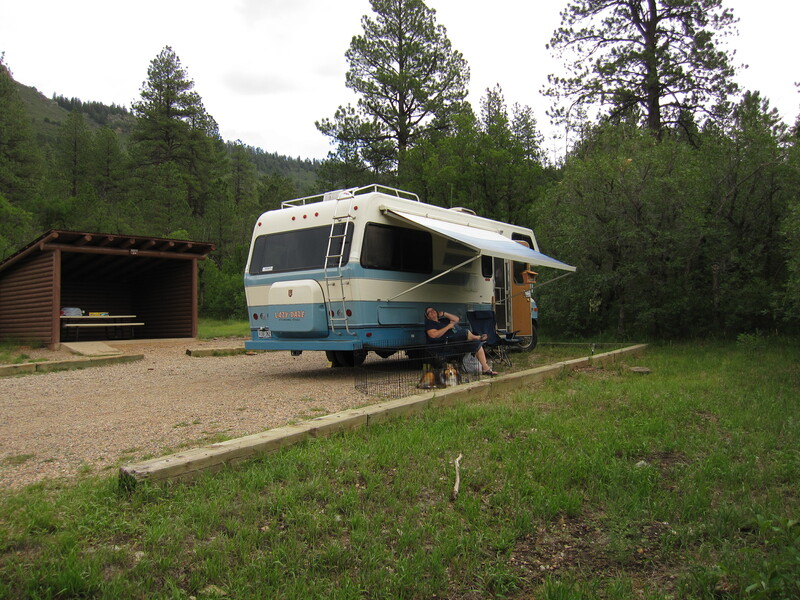 Fortunately the ADA accessible site had vacated earlier in the day and the camp host was able to give us that site. So, we were able to stay at Coyote Creek another night. 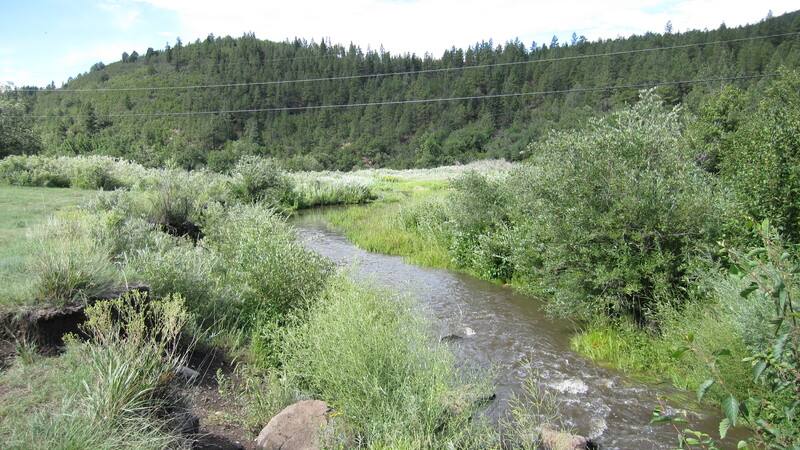 I would like to go back to Coyote Creek another time and stay longer. The weather in the summer is just fantastic. I could do it now, too, since I had new batteries installed in Laramie, WY. But that’s a story for later. This entry was posted in Coyote Creek State Park, New Mexico and tagged Coyote Creek State Park, New Mexico by ontheroadwithriley. Bookmark the permalink. Great blog very interesting stuff and pictures! Keep up the great work! Thanks! I have so many pictures, the hardest thing is finding the best few to attach and getting them uploaded/formatted.